The 30-year-old from Missouri was one of online poker’s biggest american stars playing under the screen name “Mig.com” and finding plenty of success including a huge win in a World Championship of Online Poker event for more than half of a million dollars. He is also a World Series of Poker bracelet winner, having taken down a $5,000 no-limit hold’em event in 2007. 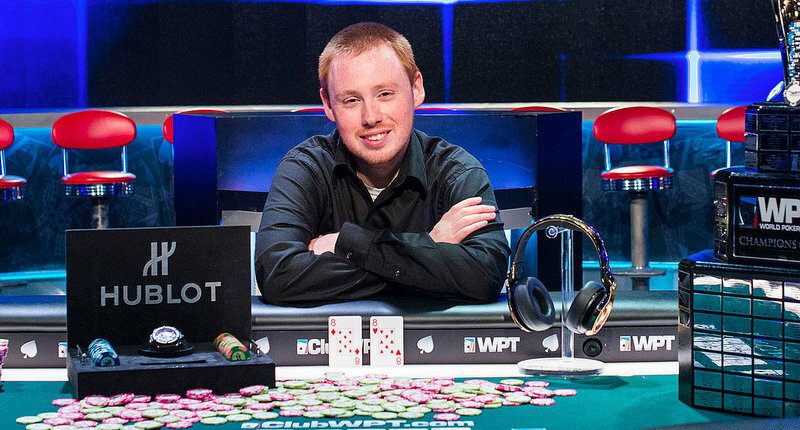 Now he can add WPT champion to his list of poker accomplishments. Mackey came into the televised final table of six players in third chip position and had plenty of tough competition to deal with including fellow WSOP bracelet winner Benjamin Zamani and 2015 Aria WPT500 winner Craig Varnell. Mackey ended up eliminating Varnell in third place to take just over a 3-to-2 chip lead into heads-up play against Zamani, who was also looking to capture his first WPT title. The two played 36 hands, with the majority going Mackey’s way. By the time the final hand arose he held a sizable chip lead of more than 3-to-1. With blinds of 150,000 – 300,000 and an ante of 50,000 Zamani limped in from the button and Mackey raised to 1,000,000. Zamani three-bet all in for 7.4 million total and Mackey snap called with the 8 8 . Zamani was in trouble with the 5 5 . Winner! Feels amazing to finally win a WPT after playing them for 10 years. Congrats to Ben on second he played great.